As a 17 year veteran of the recruiting industry, I’ve interviewed thousands of candidates at all levels and stages of their careers. I’ve evaluated top performers, role players, and underachievers. Through these interviews and discussions with hundreds of employers, I’ve been able to pinpoint a myriad of reasons why some people climb the ranks and some don’t. Here are my top 4 keys to advancing your career. You’ve probably heard this saying before: It’s not what you know, it’s who you know. This phrase is of little consolation if you feel like you are getting overlooked for promotion opportunity. Out of all the factors that business leaders consider before deciding who to give that coveted job to, the most important reason is TRUST. –	Do they trust that you will achieve your goals and the department’s goals? –	Do they trust that you will be able to help them achieve THEIR goals? –	Do they trust that you will rise to the occasion during a crisis? You’ll need to be able to answer yes to all of these questions if you want to get promoted. How do you get company leadership to trust you? Exposure, performance and time. Like any relationship, the more company leadership gets to know you and sees you in action over time, the more likely it is that they are going to trust you. How do you get exposure? Ideally, this is something you should be thinking about before you decide to accept a new job or project. You should consider if the role or project is going to help facilitate exposure to leadership or if it isolates you from them. Once you have joined a company, then you need to figure out who the key decision makers are and put yourself in a position to interact with them. Webster’s defines the word Proactive as controlling a situation by making things happen or by preparing for possible future problems. Wallflowers rarely get promoted. This doesn’t mean that you have to be an A-type personality to succeed, but it does mean that you have to be willing to step up. Top employers look for leaders that don’t just sit at their desk and execute day to day tasks. They want proactive personalities that find ways to add additional value to the company. How do you demonstrate that you are proactive? •	Volunteer to lead a cross-departmental project. •	Identify process improvement opportunities to create efficiencies. •	Speak up during team meetings and offer constructive ideas. •	Step up during a crisis and find out how you can help. Proactive employees also make it clear to their supervisors that they want to advance their careers. How do you expect to get a promotion if your boss doesn’t even know you want one? Approach your career with an end goal in mind. If your long-term objective is to be a CFO, then you need to figure out what skills you need to get there. The most successful candidates I’ve evaluated have a career plan. They make short-term career decisions based on whether or not each opportunity helps them reach their long-term goal. In addition, they periodically assess where they are in their career and they are willing to make the necessary changes to stay on track. How do you identify what skills you need? Find a mentor. Identify industry leaders that have already accomplished what you want to achieve. Develop a personal relationship with them or simply use their career as a benchmark. In an ideal world, your mentor will be part of an organization which you already belong to like your current employer, professional organization alma mater, etc. It doesn’t always work out that way so you may need to look elsewhere. Many candidates, particularly early in their career, are only open to a job change when they have consciously decided they are ready. This approach limits your career possibilities. The reality is that you are only seeing a small window into the job market if you peek in for a brief period every few years. The perfect opportunity to accelerate your career may come and go and you wouldn’t even know about it. Seek out and develop a relationship with a leading recruiter in your field. Top recruiters primarily represent passive candidates. These are candidates that are performing at a high level and are satisfied with their current job. However, they are open to hearing about opportunities that are significantly better than their current situation. Just make sure to communicate that you are not actively looking and provide the recruiter with very a specific set of criteria for the jobs you’ll consider. Having a strong resume will help you get an interview for your dream job, but it won’t necessarily get you an offer. The more attractive the opportunity and company is, the more competition you’ll get from other candidates. 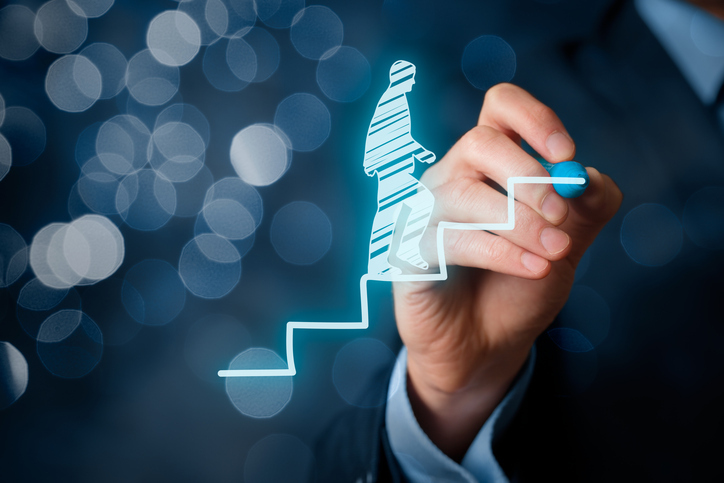 While work performance tends to be a more important factor why someone gets promoted, credentials and education can certainly help improve your chances and give you more options. Top employers are more likely to have strict requirements for credentials.